When you think of 2D fighters, Arcana Heart probably isn’t the first series that comes to mind. Although it has never achieved the same level of fandom or been used in tournament play like BlazBlue or King of Fighters, Examu’s series has still had a dedicated following. The series is best known for its large roster that is entirely female, and the first entry came out in arcades back in 2006. Since that time a Playstation 2 port of the original Arcana Heart was released in North America by Atlus, but the second installment had its international release canceled due to poor reception in Japan. Gamers did get the chance to try out the third title though, which came out as a PSN exclusive from Aksys Games in 2011. Three years later, Examu’s given the game a significant upgrade and rebalancing in the form of Arcana Heart 3: LOVE MAX!!!!! for Playstation 3 and Vita, and Aksys has once again brought it over (though this time there are physical and digital options). Despite being familiar with the Arcana Heart name, I hadn’t played any of the games in the series before LOVE MAX!!!! !, so this will serve as my introduction to the series. When approaching most new fighting series it is standard to expect a learning curve, as getting the nuances of the mechanics down and figuring out the best plan of attack is always the key to success. But one of the first things I noticed as I jumped into the Story mode was that there is a bit more depth and complexity to this one than I had anticipated. At its core, Arcana Heart 3 has a lot of the familiar 2D fighting game elements. Each character has three different types of attacks and special/super moves, as well as the ability to dash or air dash similar to Guilty Gear or BlazBlue. There’s a lot more happening in each battle than just that though, and learning all of the nuances will take a considerable amount of time depending on which characters you want to try and master. Each character not only has a different type of weapon that lends itself to different strategies, but each one wields an Arcana which is a celestial being that lets them use different elemental attacks. Each Arcana has offensive and defensive statistics, and the way they’re utilized varies considerably. This isn’t one of those fighting games where a handful of the cast controls in the same manner, so starting off I found it best to pick a couple of specific characters to try and learn the mechanics with. Attacks might vary wildly depending on whether someone is using a sword, guns, or running around in a giant robot, and the Arcana grant everything from the ability to freeze the opponent in time for a brief window to projectile ice beams. Learning how to properly utilize all of these combinations was a lot of fun, and when you consider that there are twenty three playable characters that provides plenty to discover. Once you have a handle on how characters and Arcana control, there is a whole slew of other mechanics to pick up. While the goal of many fighting games is to string combos together and then pull off super moves, this is the main key to success in Arcana Heart 3. To put it simply, if you don’t time your blocks effectively and then counter with a string of combos leading into a special, you’re probably not going to beat the later levels of the Story mode. The game has an emphasis on aerial movement, and when you’re dashing in mid-air you can home in on the enemy to launch yourself towards them and continue a combo. Additional mechanics include a charging function that creates a burst of energy that pushes the opponent away, guard breaks, and other additional moves that let you deal maximum damage. Special moves such as the Arcana Burst and other character specific supers must be done with the appropriate button inputs once you’ve filled up your Force Gauge. It may sound like a lot of details to keep track of while you’re fighting, and I did find that it took me a couple of days to really start to get some of the basics down. The learning curve is a bit higher than I had anticipated, but after a solid two weeks of playing almost every day I feel like I have a good handle on how to effectively approach combos and homing, though I continue to learn additional nuances each time. Based on the description above, you may be picturing this as a fast paced Arc System Works style fighter, and while things can get hectic when either you or your opponent are stringing combos together the movement is a bit slower overall. In fact, I was surprised at how slow the movement felt when your character wasn’t dashing and it take a little getting used to. Combine this with the fact that a lot of the playable cast has moves that arc upwards in directions you might not expect, and this does add to the learning curve a bit. My suspicion is that there may be some fighting fans that don’t like how the movement feels if they’ve been playing other titles for a long time and may not be able to get into Arcana Heart 3, but if you’re like me you may just find the quirks enjoyable. There is the option to switch between Normal and Simple in Story mode as well, which assigns specials and Arcana attacks to buttons instead of requiring specific directional and button presses, and this does make things easier. Fighting games on consoles have a history of not always packing that much content beyond the standard story and training modes, but Arcana Heart 3: LOVE MAX!!!!! is bursting with plenty of things to do. There is one caveat to this though, and it’s dependent on whether you are interested in visual novel style story sequences are not. The game has a distinctive anime look to it, and all of the story scenes are animated in a way that has that same visual novel backdrop to it. Most players will likely check out the Story and After Story modes first, which is where these appear. What’s different about this series is that not only are there 23 playable characters, but each one has selectable routes. As you make your way through the stages, you are often presented with an option of who you want to fight. This will result in different dialogue scenes in between fights, and certain routes will unlock bonus scenes in the Gallery. It’s a nice twist that gives incentive for repeat plays with the same character, provided you’re interested in watching the story scenes. Arcana Heart 3’s story is fairly typical for a fighting game, as your character of choice is trying to prevent an organization from using a powerful weapon to destroy Japan. What’s also typical is how powerful the last two opponents are, as the AI suddenly takes a massive leap forward and if you mess up the timing of your blocks or combos at all they will absolutely destroy you. The one major difference is that all of the characters have common ties due to events from the previous games, so you’ll see a lot more banter and connections between them than in most fighting series. The After Story mode is a lot sillier, and places an emphasis on quirky narratives and a healthy dose of fan service. As you might expect from the name, this takes place after the main Story mode and has the characters all teleporting around for some mysterious reason. The difference between After Story and Story is that each character only has one fight to go through, and the rest of their route is the visual novel style dialogue. I’ve seen Arcana Heart mentioned as having some yuri elements, and the fan service and yuri is definitely dialed up a notch during the After Story sequences, particularly some of the later ones. It’s definitely an acquired taste, and if you’re coming to this game just for the fighting itself this mode may not be of interest. Aside from the two story modes there are plenty of other modes for players to explore. The usual Training mode is there that lets you practice your combos, though it’s against a static opponent. I found that the Trial mode was more useful in teaching the mechanics, as you pick one of the characters and then have to complete a series of challenges in each match. One might have you completing a certain number of air attacks during the two rounds while the next might only count combos. It’s a series of fun challenges and it is a much more useful than the Training mode. Examu also added in Time Attack and Survival, and there is multiplayer functionality via Playstation Network. Though the net code seems quite stable, the community isn’t terribly active and I only found one or two rooms with people playing at a time, so keep that in mind if you’re planning to pick this one up with multiplayer in mind. Finally, there’s the Gallery mode which contains unlocks from the various modes. If you’re a completionist you’ll be hunting down the various routes to unlock all of the artwork and bonus routes for some time to come. The original arcade version of Arcana Heart 3 came out back in 2009, and this is reflected in the graphics. While there’s nothing bad about the animation and things do move fluidly, the sprites and backgrounds lack that visual fidelity and sharpness of some of the later 2D fighters. Additionally, the game doesn’t do proper widescreen either, instead opting to show silhouettes of each character on the sides to fill up the rest of the screen. The translation for the dialogue is adequate, though I did notice a series of misspellings during the After Story sequences. It’s certainly not the flashiest looking fighter out there, though the bright and colorful look of the characters should give the game a good deal of appeal. Additionally, the fights all run smoothly and I didn’t notice any major input delay or lag that could affect gameplay, which is the most important element when it comes to this genre. Sound fares a bit better, as the soundtrack has some catchy tunes (though you likely won’t have time to pay attention to a lot of them during the fights) and the voice acting is great as well. If you’re an anime fan you’ll notice quite a few familiar voices, as the developers were able to recruit actresses that have been a wide range of series. I appreciate that Aksys was able to keep all of the voice work intact, as it adds that extra flair to the presentation. 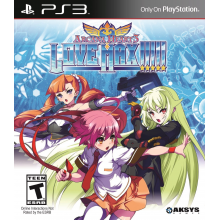 There are elements of Arcana Heart 3: LOVE MAX!!!!! that will make it a bit of an acquired taste, as the flow of the gameplay is a bit slower than some of the more popular 2D fighters and the overall feel is looser. Additionally, if you’re not that interested in the visual novel style dialogue paths that dominate the After Story and Gallery bonus content this may not be the right fighter for you. But if you’re like me and enjoy a healthy dose of anime, visual novels, and solid fighting mechanics that will take some time to master then this is a game worth purchasing. It has plenty of charm, and you’re sure to find a handful of characters that you like playing as, and while Examu could still tighten things up a bit next time around to make this series competitive with some of the bigger ones I’ve still found myself returning for just another round time and time again. Arcana Heart 3: LOVE MAX!!!! Coming to US! French Bread’s Under Night In-Birth Exe: Late Announced for NA! LET’S ROCK! Pre-Order Guilty Gear Xrd -SIGN- Today! BlazBlue: Chrono Phantasma Launch Date and Bonus Announced!